I was at a hen weekend, the bride’s sister had originally planned that we rented a cottage in the Doonbeg five-star resort, but reality and the recession bit and everything slowly down-scaled to a house borrowed off her cousin in Carron, County Clare. 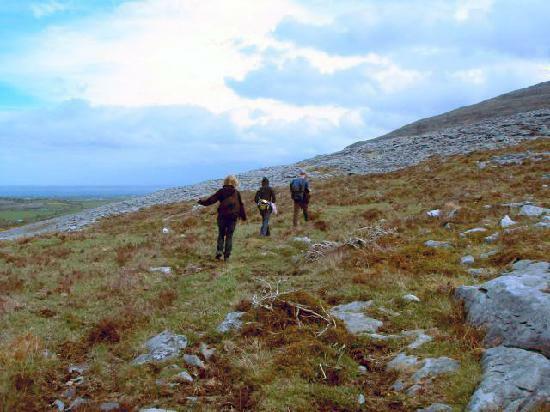 There was a bit of initiative needed to make up for the tight budget and we started with a treasure hunt across the Burren, counting gates and searching in graveyards for clues. On our quest we visited the famous dolmen at Poulnabroune and Caherconnell Stone ring fort. The area is heaving with fascinating stone-age archaeological sites. The hunt lead us to the start of a two hour gentle uphill walk over the hills, through fields of Mountain Avens, Birdsfoot trefoil, the last of the Spring Gentians and the start of the Orchids. A Burren flowers ap for the iPhone would be handy. It is Burren in bloom week (www.burreninbloom.com ) When we reached the summit we were met by a view of the warm stone hills folding softly down towards the sea at Ballyvaughan and a picnic with Kinvara smoked salmon and, of course, champagne. From a limited kitty the chief bridesmaid had piled the kitchen high with local produce. The mouth watering slow-cooked, caramelized pork belly and marinated rack of lamb, salads and spicy vegetable dishes deserved at least 7 stars. I met the bride to be over fifteen years ago, we were both young mothers and she was the one to care enough to tell me to my face that I should leave the abusive relationship I was in, that it was not okay to be treated like that. Everyone else, I am sure, was saying it behind their hands and my back. When you’re young and naive it’s hard to see the wood for the trees especially when there are children involved. Over a few Cosmopolitans eyes welled up as I told her, yet again, how grateful I was to her and blessed to have her as a friend, and how strong, supportive and insightful she had been at such a young age.